Political commentators sympathetic to the Palestinian Authority (PA) and the Fatah movement in particular fanned out as soon as news of Mohammed Shtayyeh’s appointment as the new Palestinian prime minister was announced. It is no surprise to witness this gush of support and enthusiasm, for Shtayyeh is a Fatah man par excellence. Gone are the days of the factional uncertainty of Rami Hamdallah, the independent prime minister who served from 2014 until he was brushed aside earlier this year. Hamdallah, like his predecessor Salam Fayyad, was meant to perform a most intricate balancing act: “Independent” enough to win the approval of some Palestinian political factions, including Hamas; worldly enough to appeal to Western governments and deal with their endless demands and expectations; and morally flexible enough to co-exist with the massive corruption racket in operation in Ramallah. However, Hamdallah, in particular, represented something more. He was brought to his position to lead reconciliation efforts between Fatah in Ramallah and its Gaza rivals, Hamas and Islamic Jihad. Although the Gazan groups had their reservations, they still felt Hamdallah was a genuine and moderate leader capable of bridging the gap and, perhaps, delivering the coveted unity. Hamdallah had, indeed, gone that extra mile. He went as far as visiting Gaza in October 2017. However, some hidden entity did not want unity to actualize among Palestinians. On March 13, 2018, a massive explosion took place soon after Hamdallah’s entourage had entered Gaza to finalize the unity government. The bomb disrupted the unity talks and denied Hamdallah the primary role he was assigned. In January this year, Hamdallah resigned, paving the way for yet more consolidation of power within the branch of Fatah that is loyal to President Mahmoud Abbas. Fatah has consolidated its control over the PA since the latter was formed in 1994. But, even then, the PA allowed for a margin in which other smaller parties and independent politicians were permitted to participate in the political processes. Following the deadly Fatah-Hamas clashes in Gaza in the summer of 2007, however, Fatah managed some areas of the West Bank, under Israeli military occupation, unhindered, while Hamas reigned supreme in Gaza. Hamdallah was meant to change all of this, but his efforts were thwarted, partly because his power was largely curbed by those who truly managed the PA: The Fatah strongmen — an influential and corrupt clique that has learned to co-exist with and, in fact, profit from any situation, including the Israeli occupation itself. Shtayyeh will try to appeal to a younger generation within Palestine that has lost faith in Abbas. Concerned by the old age of Abbas, now 83, and wary of the continued influence and power of shunned Fatah leader Mohammed Dahlan, the pro-Abbas Fatah branch in the West Bank has been eager to arrange the future of the PA to perfectly suit its interests. That “recalibration” has never ceased. In May last year, the Fatah-dominated PLO’s National Council elected Abbas as chairman of the Executive Committee. The committee was also assigned eight new members, all loyalists to Abbas. Abbas and his supporters had only one hurdle to overcome: Hamdallah. It is not that Hamdallah was much of a political fighter or a maverick to begin with, it is just that Abbas’ loyalists detested the idea that he was still keen on achieving reconciliation with Hamas. For them, Shtayyeh’s appointment is the most logical answer. Shtayyeh possesses all the features that qualify him for the new role. His “seven-point letter of assignment,” which he received from Abbas, calls on him to prioritize national unity. But that would make no sense since Shtayyeh, who has been close to Abbas since the early 1990s, has a poor track record on that front. Shtayyeh is a two-state solution enthusiast, as his legacy in the Palestine negotiations team clearly demonstrates. His article in the New York Times in October 2016 was a desperate attempt to breathe life into a dead option. His language is very similar to that used by a younger and more energetic Abbas during the heyday of the Oslo Accords. But Shtayyeh is different from Abbas, at least in the appeal of his own persona. He hails from the First Intifada generation of 1987. He was dean of students at Birzeit University in the early 1990s. Birzeit has served as a symbol of the revolutionary class of Palestinian intellectuals in the West Bank, and even Gaza. 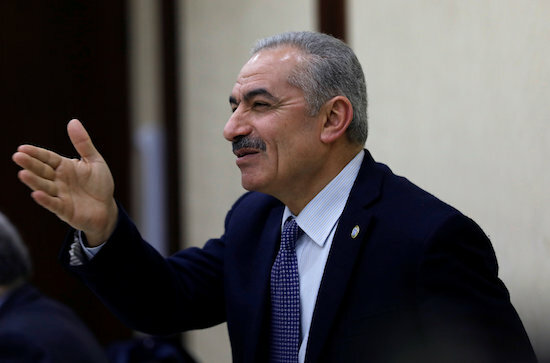 Shtayyeh’s ability to connect with young people — as he places constant but guarded emphasis on the resistance against Israeli occupation — will certainly bring new blood to the aging, irrelevant PA leadership; or, at least, that is what Abbas hopes. “We do not want to preserve the same status quo,” Shtayyeh told Al Quds newspaper in 2017. “The Palestinian government... has to... turn into a resistance authority against Israeli settlements. We should be able to take measures without the permission of Israel, such as digging water wells and reforesting Area C in the West Bank,” he said. The type of “resistance” proposed by Shtayyeh hardly pushes Abbas out of his comfort zone. However, the aim of this language is barely concerned with digging a few wells, but to reintroduce “revolutionary” rhetoric to the prime minister’s office in the hope of reinventing the PA and renewing confidence in its ailing and corrupt institutions. Shtayyeh’s mission will ultimately fail, for his actual mandate is to reunite Fatah behind Abbas, not the Palestinian people behind a truly democratic and representative leadership aimed at ridding Palestine of its Israeli occupiers. The sad truth is that the latter goal was hardly a priority for Abbas or his loyalists in Ramallah in the first place.